I finished the back plate and attached it to the rims. It was quite a bit of work to get this right. Took some time. I used a safe-t-planer to make ledges on the outside face of the plate. Made it go pretty fast, then I used a hand plane to take off the edges and then a random orbit sander with 50 grit disks to finish the rough process. Then I switched to 100 grit to fine tune it. Cleaned it up with 220. I used cork on top of a block. I modified a forstner bit, ground off the center pin. It worked pretty well. I could hog off a lot of wood, and the block was wide enough that when the pressure from the bit bit into the wood, the wood matched the angle of the top. 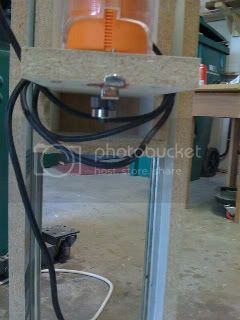 The only problem I had was that the drill press wasn't deep enough to get to the middle of the wood. So I had to chisel out the center. Cleaned it up with 50 grit sanding disk, and then 220 to smooth it out. Finished thickness is 1/4 inche. It's pretty thick. I will probably take it down a little when I finish sand and prep the edges for binding. All in all pretty good deal. Oh, the inclusions you see, the brown streaks will be hidden in the tabacco burst. One in the top and one near the bottom. 1. 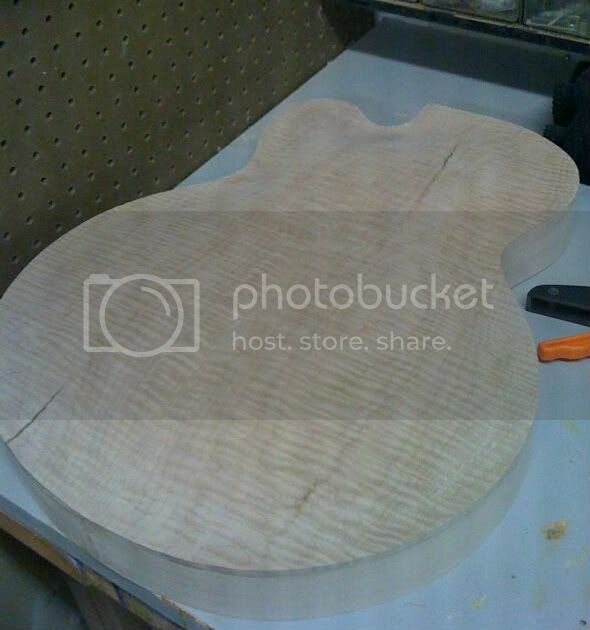 My back is flatsawn curly maple, 1/4 inch thick in the middle, will be thinner (Recurve) toward the edges. Do I need to brace the back? 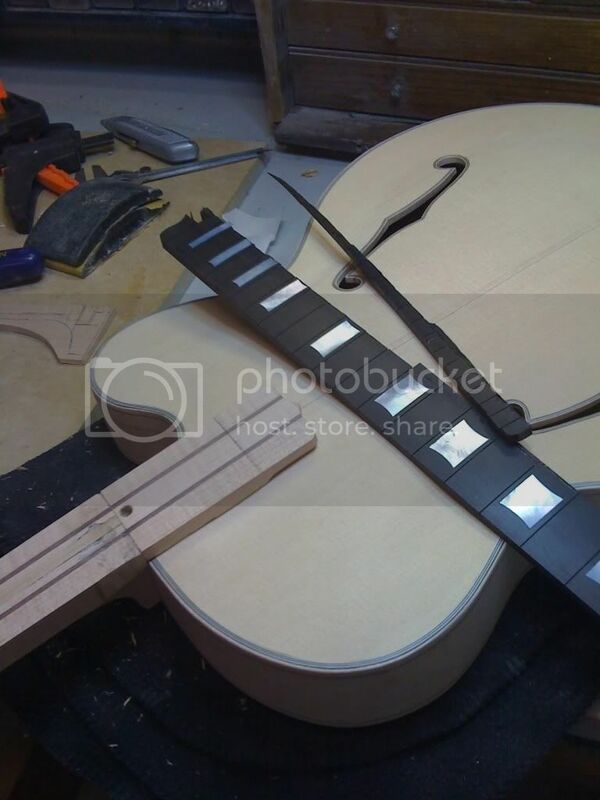 I looked at a couple of hollowbodies, and only the spruce top is braced. Benedetto's book says brace the top, doesn't say anything about the back. He could be assuming that you do the same to the back as the front.. Or assume I know that you don't. The only reason I'm asking, the two guitars I checked have laminate backs mine is solid..
2. 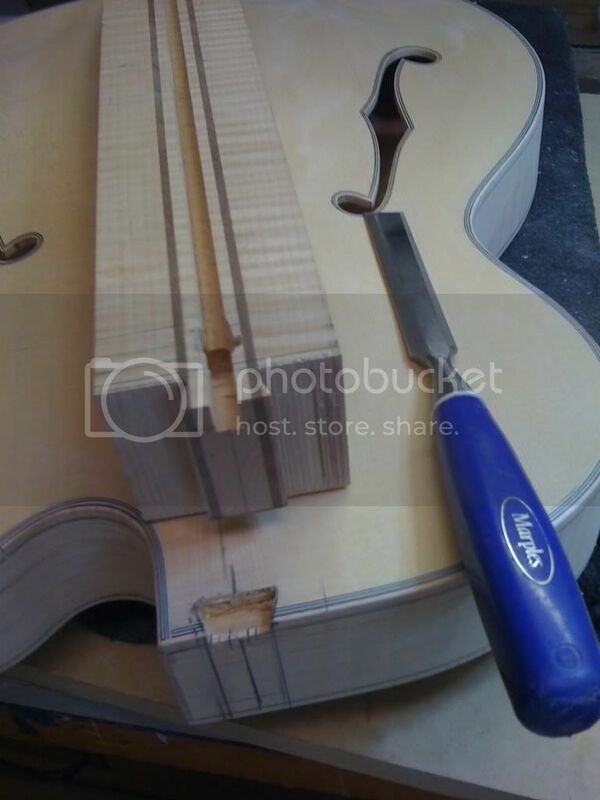 My spruce top came in, I opened the box and let them sit in the shop a week, then I pulled them out joined the halves and let them sit for a week and a half to aclimate to the shop. I always to that with new wood. I carved the top, and left it on the bench overnight, it curled up like a potato chip. 1 1/2 inch off the table on both sides. For quarter sawn wood that is a lot of warp. 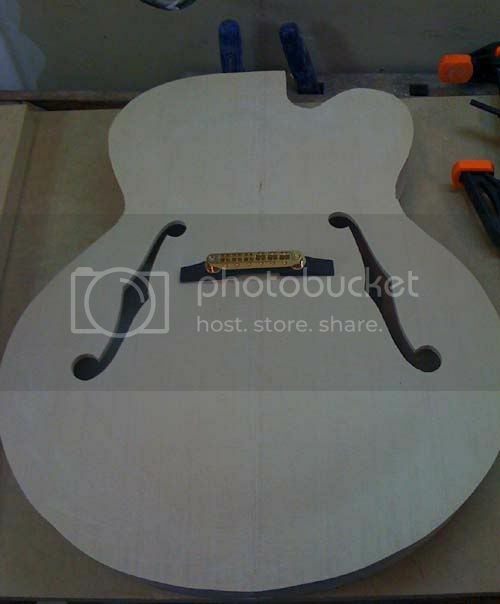 I thought when you spend 90 bucks on a spruce top plus 50 bucks shipping, it would come in seasoned better then that. I think that is a lot of movement. I didn't check it, I assumed it was seasoned, and that a couple of weeks in the shop would stablilize it. Do the spruce tops that come in come in green and I just didn't realize it? A moisture meter would be useful, but you're right - it is a lot of warp. 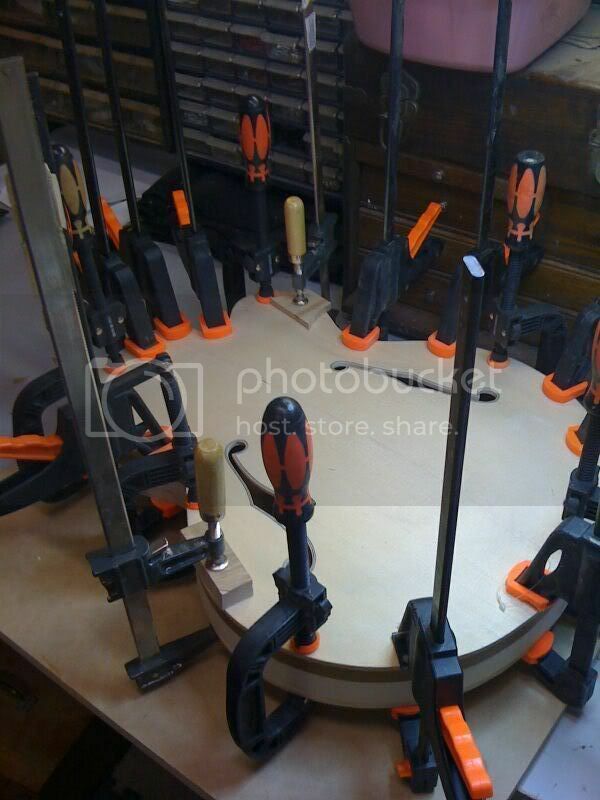 I'm sure about softwoods and whether they can be clamped/glued in place despite warp but it sounds like quite an issue, especially if it is unseasoned. So, I spoke with the Spruce Vendor. It turns out that the Split wedges ship between 20 and 22 percent moisture content. He said that he is in a rain forest and the wood is stored in an unconditioned building. It would have been good to know that huh! I let it sit two weeks before I cut into it, but the day I carved it, it was 70 degree's and sunny. No wonder it warped like a potato chip. I've rehydrated it by putting it in the garage, it's raining outside, so that will bring the moisture content up. 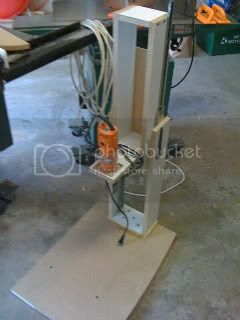 I've slowly clamped it back to flat in the building jig. When I unclamp it, it only springs up a quater inch or so. Pretty much flat. 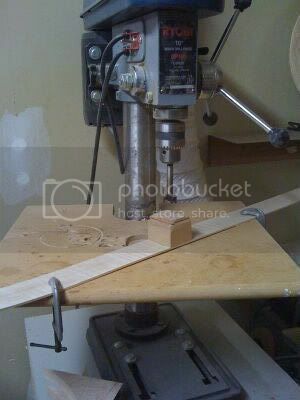 I've moved it back to my conditioned shop and will let it aclimate for a while before I glue it to the body. I think I was lucky, no cracks. With shipping the top was about 130 bucks. Having it crack would have been heartbreaking. Anyway, here are progress pictures. Looking like a guitar body. 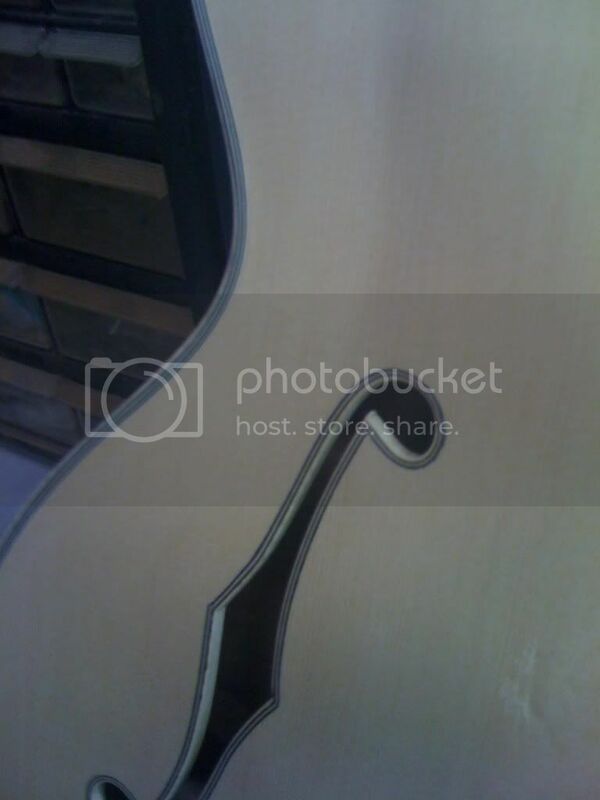 Neck with truss rod. Block in the back is for the extension. I just got all my binding in. Little tiny strips of binding. This stuff is 0.010 in thickness. It should be interesting putting that on without getting glue all over my fingers! 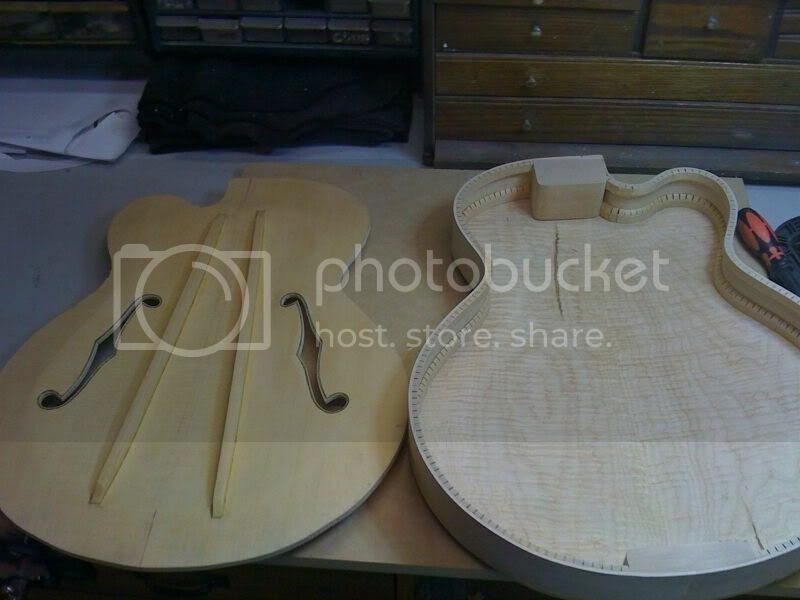 Next steps is to bind the F-Holes and attach the top. Then the dovetail neck pocket. I'm planning on hitting the inside of this with a light coat of nitro to seal up the inside. With the moisture content of the top all over the place, I thought it would be a good idea to do that so the moisture content changed more slowly. Anyone Screaming "Nooooo" after reading that? My 335's I left unsealed. I've got the top finished and the bracing in. Last chance for anyone to see the inside.. I use landscaping tape which is stretchy to hold the binding in while it drys. It's amazing the learning curve on 11 ply wooden binding. It's coming out nice, but there was a huge learning curve. I burn't some of it, I broke a lot of it, I soaked some of it too much and it swelled up. I cut my binding chanels too deep and had to reduce the thickness of the back a bit (I allowed for that by leaving the back a little thick), Did i say I broke some, I broke a lot of it. I got the back done, took a break and the front went much better. Lessons learned. 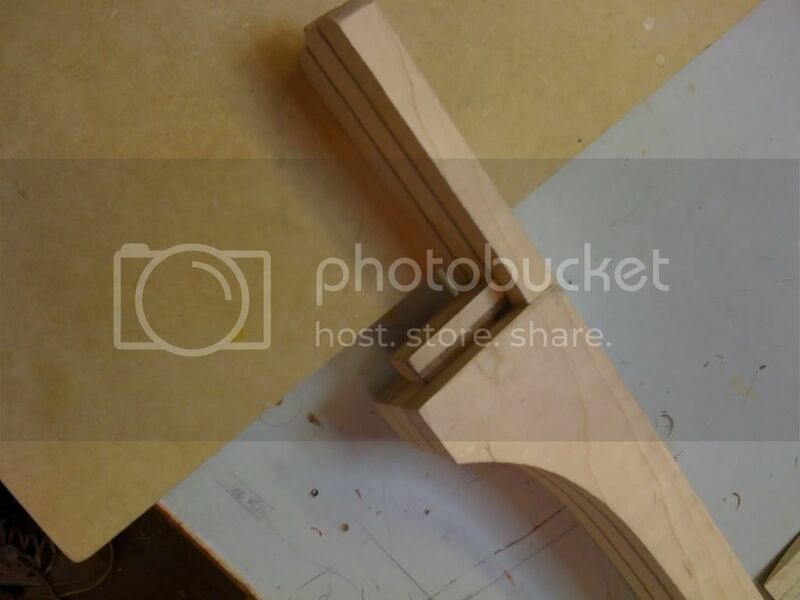 I used the Stu-Mac binding router bit kit, it works great. I'm very happy with it. I used a soldering iron as my heat source. I found out what happens when you are doing cleanup at midnight, and forget to unplug your soldering iron, when the inderside of my forearm hit that tip of that soldering iron, I learned quick what it means to have a cauterized hole in your arm. Ouch! I looked at it, I have a pretty deep hole, no blood. It has two channels, like stair steps. One is the w/b/w/b/w/b/W that you see on the top, the first 6 ply is .020, which is really really thin, and the final W is .080. From the side it's a 1/4 inch wide white strip from the top, with bwb at the bottom of the channel. You have to glue all that at the same time to get it to lay right, I found that I just put a cup of glue on the bench and dip my fingers in the glue and run my fingers over the various strips to cover them. Trying to use a glue brush on all those sides and parts took too long and the glue got too tacky. Then you have to sqeeze it all together to make sure the glue doesn't pool inbetween and it's a tight fit, you'll see it in the finished product, the black lines would be wavy if there is any excess glue. Then you have to get it in the channel, tape it off and start on the next 6 inch section. The area around the horn was a pain, the outer binding just didn't want to make the curve. 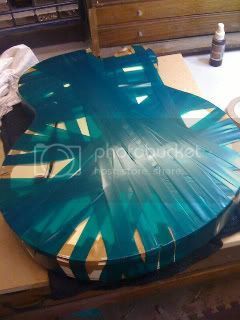 I wanted to do one strip around each half of the guitar, but ended up cutting the binding at flat spots in the guitar so I could have smaller strips to work with around the curves. It worked well, I ended up with a couple of extra joints, but once it's finished no one will notice. The joints are clean, so not a big deal. I use garden tape to secure the binding (After it's taped in place). This stuff it about 3 bucks a package and is stretchy. If you pull it tight, it has a lot of tension. I wrap it around and around making sure to pull it all in tight. That way if there is any section that pulls away, this will secure it. Love the stuff. Better then tape, don't have to unstick it. I do tape the binding first to get it on there, but this is what pulls it tight. Anyway, binding like this is an art. I have a lot to learn. Just takes practice I guess. ooops.. Router blew up the neck. Expensive error. 70 dollar fretboard and inays. Plus the time to cut and install the inlays. Ouch. 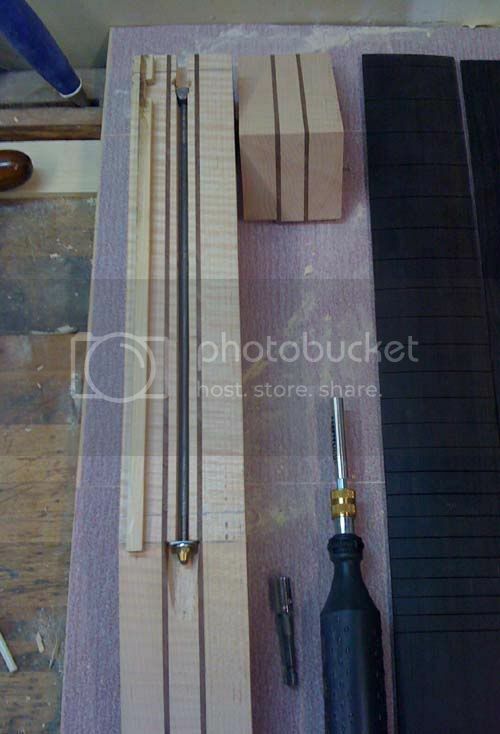 I don't have another 23.5 inch fretboard, but I do have a 24.75. 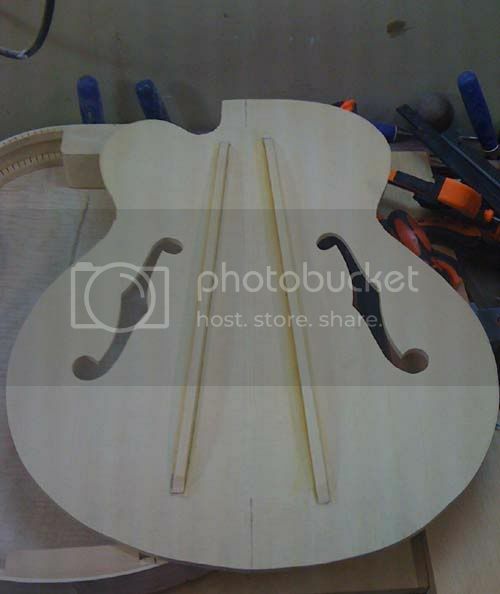 I'm going to remake the neck for the board I have. It would take weeks to get another fretboard. I exercised my vocabulary when I blew this up. I guess I knew better. Ebony is hard stuff, I guess I shouldn't have tried to route the endgrain. Very disappointing. 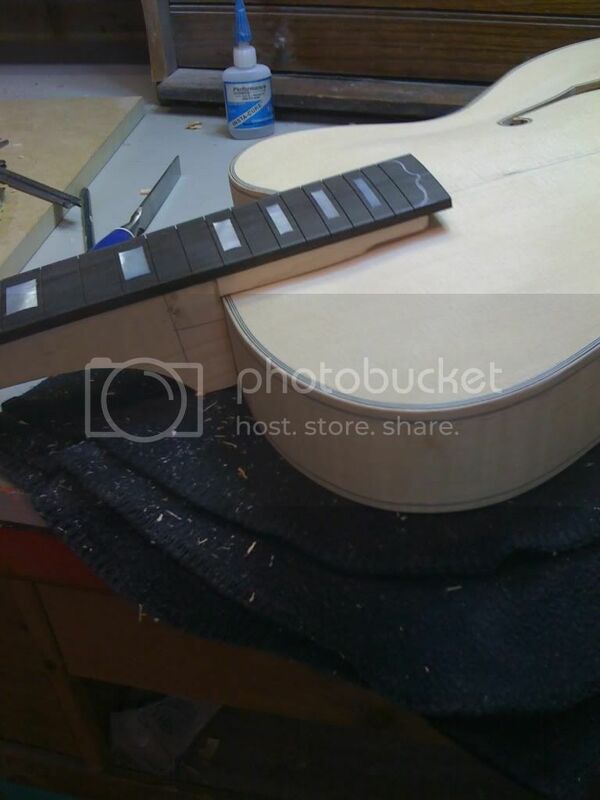 Keep steady with it John- its coming out great- hate to see that happen with the fretboard. Always something to learn when you build- its just some lessons hurt more than others. Your builds have been great to watch- keep up the good work. What caused it exactly? 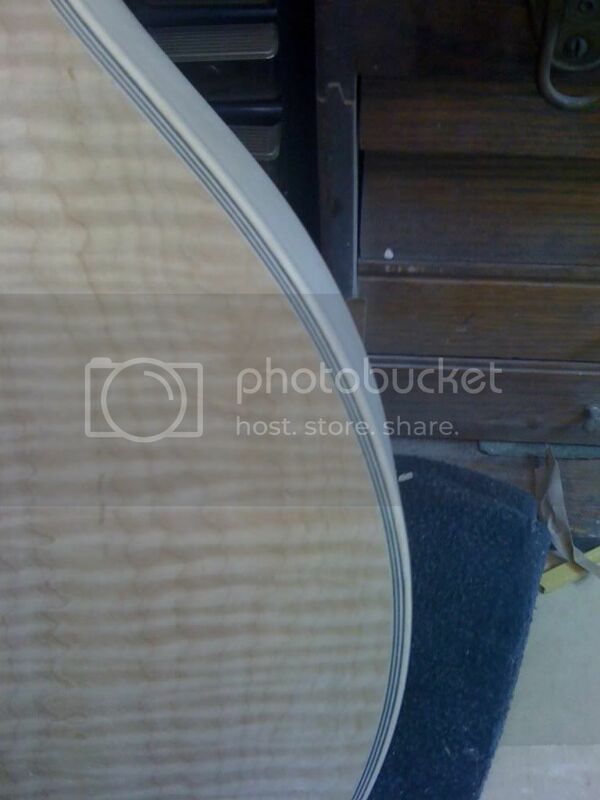 Perhaps a "closed" an existing crack in the Ebony caught and blew out? Not fair, especially after those BEAUTIFUL f-holes. Not sure what caused it, guessing my router bit was just too aggressive for the wood and dug in. This ebony is very hard, guessing it's straight grain too based on the way it broke. The router grabbed hold of the end grain and split the thing right in two. I've done a lot of routing, and have had oak chew up when routing endgrain, but no other wood. Guess I learned a lesson. I could have sanded it down instead of routing the endgrain, it would have been safer. I had no problems with the sides, followed the template fine. 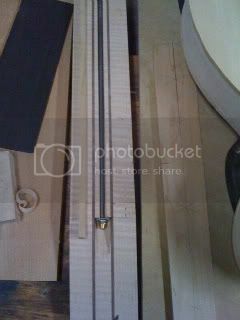 I could have also glued the board to the neck and routed, it was double taped to a template. If it were glued down, it would have had cross grain support. Could be my bit I suppose, I'll check it tommorrow. Nope, no way. The end of the board is a mess. I've got a new neck about 1/2 way done. It's going to be better anyway, more practice! That's a very positive attitude to have John - keep it up! I'm really enjoying seeing this take shape. So I'm working on the headstock inlay. After much thought, I came up with a plan. 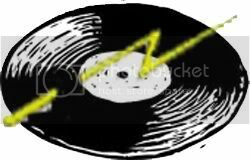 I want to have a record (LP) with a lighting bolt through it. Retro/Rockabilly kinda thing. Two things I could use advice on. 1. I want to make sure people don't confuse it with a spare tire. Not what I'm going for. 2. Records are black, the background is ebony. Here is what I have so far, for you inlay experts, how do you convert something to look good when it's black and the background is black? Here is my starting point. Differences in reflectivity, embossing and highlighting. 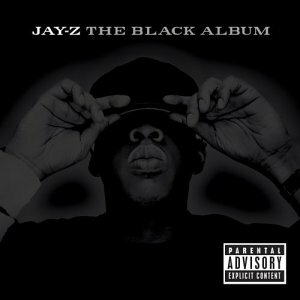 Kind of like the Black album. Well, I could make the entire grpahic out of MOP, and scratch and shade the black parts with black epoxy. 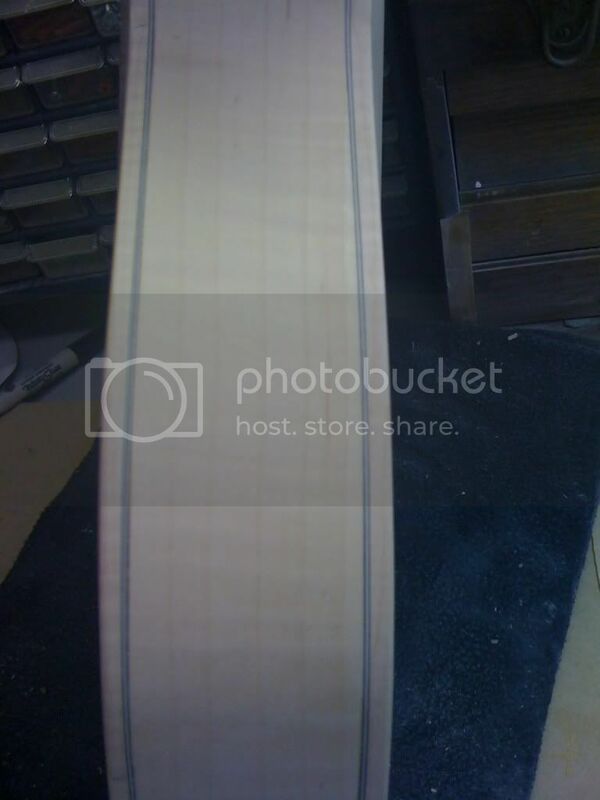 Or I could do just the white parts, and scratch the black lines in it and imply roundness. I'm not sure that would come out right. I have some yellowheart for the lightning bolt or I could pick up some gold MOP. Not sure that would stand out enough. I'm not an artist.. 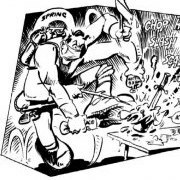 I can build stuff, but design work is not my area of expertise. Black on Black would be too subtle for what I'm going for. Any suggestions on how to modify the design so that the end result is where I'm headed? I could use a different color for the LP. 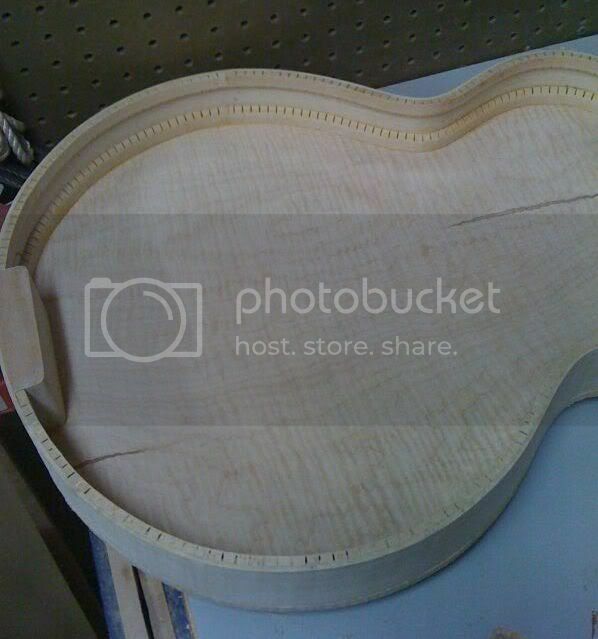 I could use wood, but the guitar is going to have MOP inlays elsewhere, woudl like to be consistant. Vinny, that's very cool! I love it. The project is moving along. 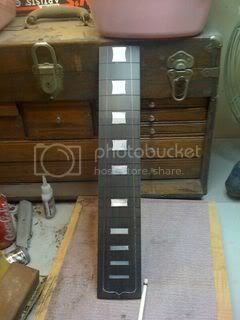 Second fretboard is inlaid, and the neck is about ready to be shaped. I'll take some pics soon. 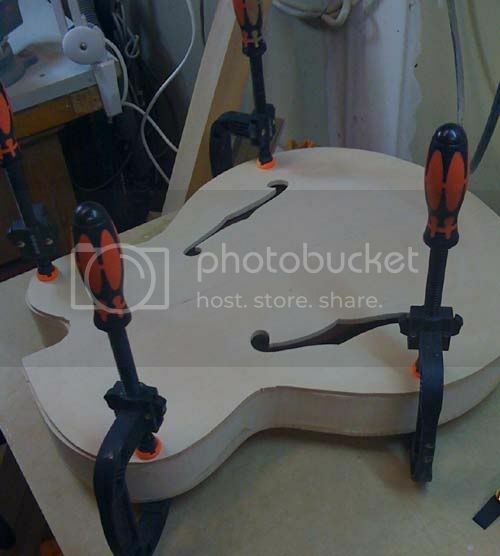 My Hollowbody will have two HB pickups, I was thinking about making pickup rings.. (Thanks to whomever posted the jig on here). 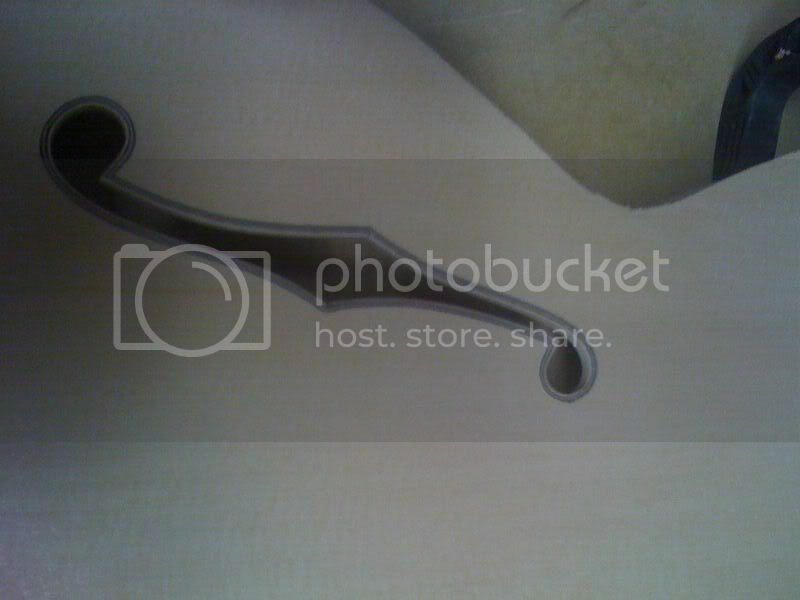 I was looking at my Gretsch and noticed that the pickup rings are flexible rubber, on the bottom, not hard. 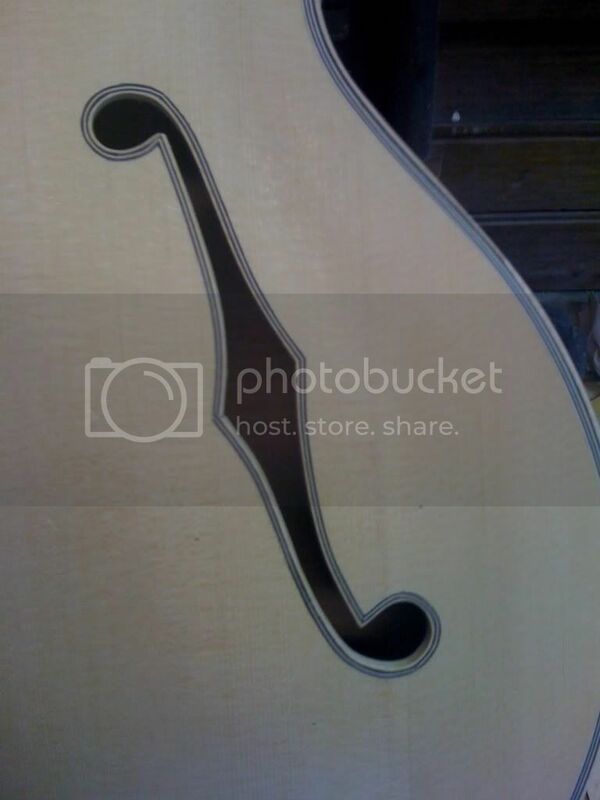 I could certainly put a gasket in between the pickup cover and the guitar, does it make a difference on dampening vibrations of the spruce top which way to go? Is the rubber of the Gretsch just so that they didn't have to mold the ring to an arched top or do you think it's there to change the tone of the guitar? I'm leaning toward wooden pickup covers cut to match the top. You wouldn't have to mold the pickup ring to the top. 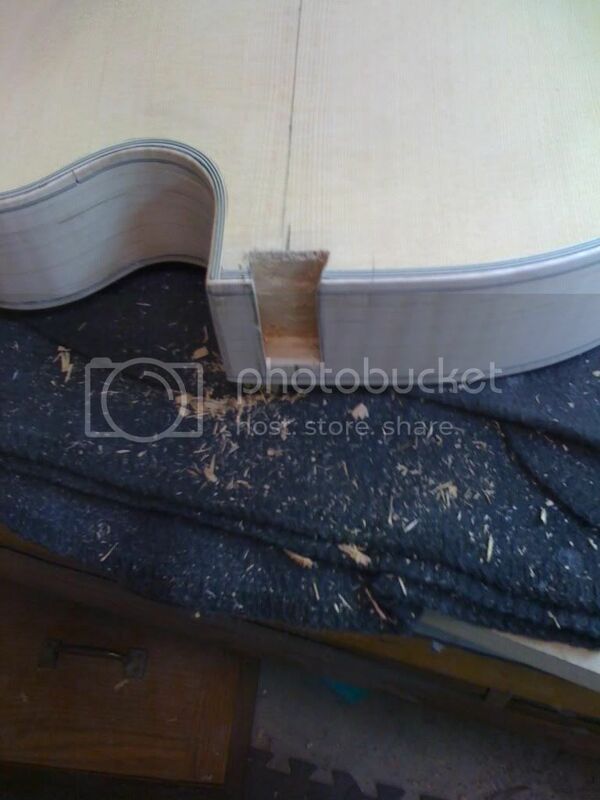 If you have enough wood left you could just route the pickup cavity edges flat so the ring sits flat in there. I don't have any experience with the Gretsch you mentioned so I can't help you there. And by the way, that jig you mentioned works great.